d if you're going to be selling the house in the near future. One of the things you have going for you is the open floor plan. Even with going darker on cabinets the feel is still open, BUT it will be dark since your countertop is dark as well so this is where a backsplash can really add a bit of color. It can also bring in contrast and something to break up all the dark finishes. You can go classic and timeless like a tumbled marble that will add warmth and texture. White or creamy off white subway tile, also a classic look and inexpensive. It can be installed in traditional subway tile pattern or in a vertical fashion that makes a timeless finish a bit more fresh and updated. Playing with the color of the subway tile may be another way to add a bit of color based on what your tastes and bold choices are. If you go with color, find a way to repeat it with accessories and other items in the rest of the open floor plan. I see a bit of rustic colors in a pillow in the other room, maybe that could be an inspiration. Another option is a matte finish, large scale glass tile in cool grey-blue or even a pale mossy green. As always, know who you are in terms of what you're comfortable with and think about the overall plan for your home, especially in an open floor plan. You've already done an awesome job I have no doubt you will take it to the next level. Good luck and repost after you've made your changes. This is a rental which for all of us who have rented or are renting, know that there certain limitations as to what you can do and even when the landlord is cool with you doing anything you want, do you want to pay for that kind of remodel in a place you don't own? NO! Is the answer, unless your landlord wants to pay for the changes due to the fact that they feel it makes the place more desirable to future renters. It looks like Jiller has made a few tweaks including some new dish towels that are nice. The red is a great punch of color. The wall color is nice but maybe think about adding a color that is a bit of a "cool" like a pale blue or go "warm" with a buttery yellow. I feel since you can't change out your cabinetry, playing with wall color can bake a GINORMOUS change in making the kitchen feel a bit more updated. Martha Stewart has 2 very great blueish-green colors at LOWE'S: Farmhouse Blue MS307 & Rowboat MS306 that could look great up against that cabinetry. All the new color would require is, new dishtowels. It's always fun to shop for accessories, so go for it. Also, think about a new ceiling light. Something like the ones above. You can find ceiling, flush mount ceiling lights that are made out of fabric/cloth that create wonderful light. Most lighting stores carry different kinds. This type of light also updates and softens the look of the room with the use of fabric, diffused light as well as the round shape which breaks up all the sharp edges of a kitchen. 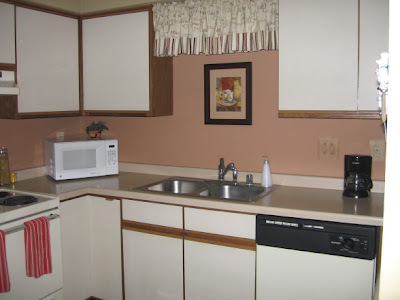 PLUS, this is another great way to bring in some color as well as pattern into your kitchen. You can rock this out, I KNOW! Keep the RMS community updated with your changes. You must NEVER sleep. When do you even have time to answer questions? Don't answer that, you don't have time. Seriously, when do you sleep? Great advice. Thanks so much for the advice Angelo! You so totally rock. Wow! When do yo have the time to answer? Is it you or an overworked, underpaid assistant? Ha! Great advice. I have SO MANY questions I do not even know where to begin. This is great since I have almost the same issue as luv2scrapbook. ALMOST EXACTLY the same layout. Scary! Now I have a great blueprint. THANK YOU! I'm not sure how to tell you how much I admire you as a designer and TV personality. Your talent is obvious and the way you handle yourself is just beautiful to watch. do you have an assistant? I do all my own writing on the blog and answer the questions as well, when I have a chance. Excuse the spelling errors. It is so sweet of you to assist. Jill has worked so hard to freshen up her Rental space which has to be a challenge to non-homeowners. GREAT JOB JILL and great advice Angelo.